Complete the look of your bath with this Trinsic 24 inch Towel Bar. Delta makes installation a breeze for the weekend DIYer by including all mounting hardware and easy-to-understand installation instructions. Matte Black makes a statement in your space, cultivating a sophisticated air and coordinating flawlessly with most other fixtures and accents. With bright tones, Matte Black is undeniably modern with a strong contrast, but it can complement traditional or transitional spaces just as well when paired against warm nuetrals for a rustic feel akin to cast iron. You can install with confidence, knowing that Delta backs its bath hardware with a Lifetime Limited Warranty. The Aspen collection's soft, nuanced shapes take the edge off any setting, allowing form and function to flow as one. The graceful design of the Aspen family will add an elegant touch to any home. Featuring an art deco inspired blend of vintage design and classic lines, the new Boardwalk suite offers homeowners a high end selection of faucets, showering products, and accessories to create a stunning look in the bath. Align 24-inch Towel Bar in Matte Black From large, open master baths to minimalist powder rooms, Align faucets and accessories bring a refreshed modern look to your home with simple lines and contemporary style. 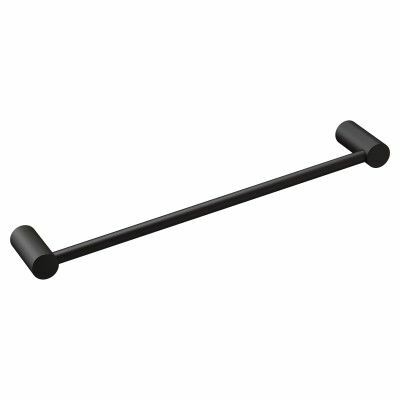 Align 24-inch Towel Bar in Matte Black is rated 4.9 out of 5 by 18. Rated 5 out of 5 by Edward from Very easy to install. It’s very important to thoroughly... Very easy to install. It’s very important to thoroughly flatten the paper template for drilling the holes. The template is folded multiple times and if it is used with any wrinkles the holes you have drilled will be off. Rated 5 out of 5 by Charles from The towel bars look great and very easy to put... The towel bars look great and very easy to put up. If you want to update your bath these are the ones. Rated 5 out of 5 by Glenna from Quality product. Love the style.... Quality product. Love the style. Rated 5 out of 5 by Kristina from Easy to assemble and very sleek looking. Love it!... Easy to assemble and very sleek looking. Love it! Rated 5 out of 5 by HomeDepotCustomer from Beautiful looking ! Needed to be cut down to... Beautiful looking ! Needed to be cut down to 10” with no trouble. Highly recommended for your purchase. Rated 5 out of 5 by Jkjrs15 from Looks great in our bathrooms. Easy to install. ... Looks great in our bathrooms. Easy to install.